In addition to their different assessments of the current state of race relations and racial inequality in the United States, Americans across racial and ethnic groups also see race and ethnicity playing out differently in their personal lives. On balance, blacks are more likely to say their race has hurt, rather than helped, their ability to get ahead. Among whites, Hispanics and Asians, more say their race or ethnicity has been an advantage than an impediment. Blacks are also far more likely than other groups to say their race is very or extremely important to how they think about themselves, but half or more Hispanics and Asians also say their racial or ethnic background is central to their overall identity; only 15% of whites say the same. This chapter also looks at personal experiences with discrimination and the extent to which people of different backgrounds say their family talked to them about challenges or advantages they might face because of their race and ethnicity when they were growing up. About half of black Americans say being black has hurt their ability to get ahead, including 18% who say it has hurt a lot; 17% say being black has helped them at least a little, while 29% say it has neither hurt nor helped their ability to get ahead. In contrast, at least four-in-ten whites, Hispanics and Asians say their race or ethnicity hasn’t had much impact on their ability to get ahead – and to the extent that it has, more say it has helped than say it has hurt. Whites are especially likely to say their race has given them some advantages: 45% say being white has helped them get ahead at least a little, while 50% say it has neither helped nor hurt and just 5% say being white has hurt their ability to get ahead. Three-in-ten Hispanics say being Hispanic has helped them, while 36% of Asians say the same about their racial background. About a quarter of each say being Hispanic or Asian, respectively, has hurt their ability to get ahead at least a little. Among whites, education and partisanship are linked to views of white advantage in their own life. Six-in-ten white college graduates say being white has helped their ability to get ahead, compared with 39% of whites with some college and 35% of those with less education. And while 66% of white Democrats and Democratic leaners say their race has helped at least a little, only 29% of white Republicans say the same. Most white Republicans say being white has neither helped nor hurt. Education is also a factor in how blacks assess the impact their race has had on their ability to succeed. About six-in-ten blacks with at least some college experience (57%) say being black has hurt, compared with 47% of blacks with a high school diploma or less education. The survey also asked whether factors such as gender, family finances and hard work helped or hurt people’s ability to get ahead. Overall, Americans are far more likely to point to their own hard work than to any other attribute as having helped their ability to get ahead. Across racial and ethnic groups, about half of men say their gender has helped them at least a little. White and black women are more likely to say their gender has been an impediment than an advantage, while Hispanic women are more divided. White women (44%) are more likely than black (38%) or Hispanic (32%) women to say their gender has hurt at least a little. About three-quarters of blacks (76%) and Asians (75%) say they have experienced discrimination or have been treated unfairly because of their race or ethnicity at least from time to time; 58% of Hispanics say the same. Most whites (67%) say they have never experienced this. Blacks with at least some college experience are more likely than those with less education to say they have experienced racial discrimination, but majorities in both groups say this has happened to them (81% and 69%, respectively). Among Hispanics, 63% of those with some college or more – vs. 54% of those with less education – say they have faced discrimination because of their race or ethnicity. Asked about specific situations they may have faced because of their race or ethnicity, 65% of blacks say someone has acted as if they were suspicious of them, and 60% say someone has acted as if they thought they weren’t smart. About half say they have been subject to slurs or jokes (52%) or that they have been treated unfairly by an employer in hiring, pay or promotions (49%), while about four-in-ten say they have been unfairly stopped by police (44%) or feared for their personal safety (43%) because of their race or ethnicity. Blacks are more likely than whites, Hispanics and Asians to say they have faced most of these situations. 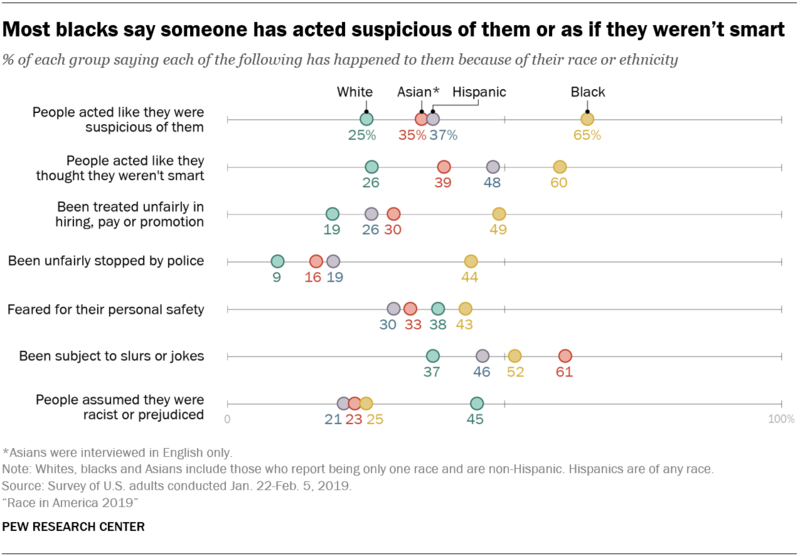 Asians are more likely than other groups to say they’ve been subject to slurs or jokes because of their race or ethnicity (61% of Asians say this has happened to them), while whites are the most likely to say someone assumed they were racist or prejudiced (45%). Within racial and ethnic groups, experiences differ significantly by gender. Among blacks and Hispanics, larger shares of men than women say they have been unfairly stopped by police, been subject to slurs or jokes, or that people have acted as if they were suspicious of them because of their race or ethnicity. Hispanic men are also more likely than Hispanic women to say they have been treated unfairly in employment situations. Blacks with at least some college experience are more likely than those with less education to say they have faced certain situations because of their race. For example, 67% of blacks with some college or more education say people have acted as if they thought they weren’t smart because of their race or ethnicity; 52% of blacks with a high school diploma or less education say the same. And while about six-in-ten blacks in the more educated group (58%) say they have been subject to slurs or jokes, 45% of blacks who didn’t attend college say this has happened to them. Many of these experiences are also more common among Hispanics who were born in the U.S. than among those who were born in another country. More than six-in-ten black adults (64%) say that, when they were growing up, their family talked to them about challenges they might face because of their race or ethnicity at least sometimes (32% say this happened often). In contrast, about nine-in-ten whites (91%) – and narrower majorities of Hispanics (64%) and Asians (58%) – say their family rarely or never had these types of conversations when they were growing up. Black men and women, as well as blacks across age groups, are about equally likely to say their family talked to them about challenges they might face because of their race or ethnicity. Seven-in-ten blacks with at least some college experience say their family had these types of conversations at least sometimes, compared with 57% of those with a high school diploma or less education. Across racial and ethnic groups, majorities say their family rarely or never had conversations about advantages they might have because of their race or ethnicity, but blacks (32%), Hispanics (26%) and Asians (26%) are more likely than whites (11%) to say these conversations took place at least sometimes when they were growing up. About two-in-ten white adults younger than 30 (22%) say their family talked to them about advantages they might have, compared with about one-in-ten whites ages 30 and older. About three-quarters of black adults (74%) say being black is very important to how they think about themselves, including 52% who say it is extremely important. About six-in-ten Hispanics (59%) say being Hispanic is extremely or very important to their identity, and 54% of Asians say the same about being Asian. In contrast, only 15% of whites say being white is as important to their identity; 19% of whites say it is moderately important, while 18% say it’s only a little important and about half (47%) say their race is not at all important to how they think about themselves. Among blacks and whites, those younger than 30 see their race as less central to their identity than their older counterparts. Still, majorities of blacks – and relatively small shares of whites across age groups – say their race is extremely or very important to how they think about themselves. Hispanics born in another country (65%) are more likely than those born in the U.S. (52%) to say being Hispanic is at least very important to their overall identity.